Why bother writing apps for Apple’s iPhone when you can write an app to write the apps. Once I decided on the "what" of the application, it was time for the "how." I fired up the Servoy Developer and created a basic schema, then sat down to decide on what I wanted the final output to be. 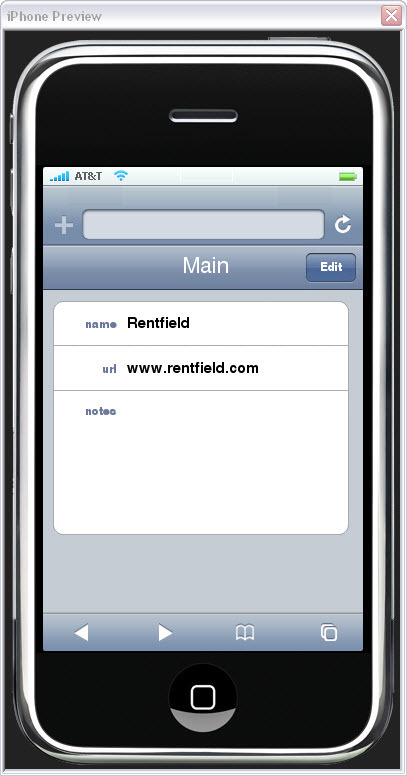 After looking at a few different iPhone applications, I decided that the default Contacts application would be the inspiration for the generated iPhone applications. I took some screen captures on the iPhone, e-mailed them to myself, and used Photoshop to snag some graphic elements. Because Servoy ships with Sybase's iAnywhere database and has sample tables, I created a form based on the companies table. I then worked out what font/styles to use for the various elements. The official Apple Human Interface Guidelines for iPhone are only available to registered iPhone developers (which I'm not), so I did the next best thingI searched the Web and looked at other iPhone web frameworks' CSS. Figure 3: The builder application even includes a native client "preview" that approximates how your finished application will look, so you can create and test applications without having an iPhone. Because Servoy's style sheets are also based on CSS, I had the basic look-and-feel up and running in no time. I created a simple list view of all the company names, and a simple company detail form. Because you only have to specify a single line of code to jump to another form, it was easy to make the click on the list show the related detail and vice versa. I didn't have to worry about the database connection or data bindingeverything I built and previewed in the Servoy Developer automatically gets rendered in plain HTML/CSS. All that was left was to view the progress, so I started up Mobile Safari to have a look. Servoy Developer has a built-in application server so it took less than five seconds to view the application "live" on the iPhone. Everything worked exactly the same as it did in the native client, and once I made some slight adjustments to the style sheet, I had a working prototype!